This month provides The Family Dinner Project, and all of our friends, partners and followers, with many opportunities to share. In a season characterized by ideals of peace, goodwill and giving to others, the family dinner table can be a place where we all talk about what this month means to us, and to find ways to convert our good intentions into actions. Share a family dinner for wounded warriors. Our #familydinnerforward campaign for #GivingTuesday is going strong until December 15. When you download and share this family dinner menu, with a recipe from military spouse and author Sarah Smiley, our partners at Boston Market will make a donation through their #BostonMarketGives initiative to Blue Star Families. Their support will help provide holiday gifts and meals to military families whose loved ones are spending the season at Walter Reed Army Medical Center. Share the meaning of family dinner around your table. We’ve joined the American Association of Family and Consumer Sciences (AAFCS) in their annual “Dine In Day,” which takes place on December 3, 2015. Part of our goal in promoting “dining in” is to encourage families to think about the benefits of shared meals — not only the research-backed benefits, but the moments that make dinnertime unique and special in individual households. 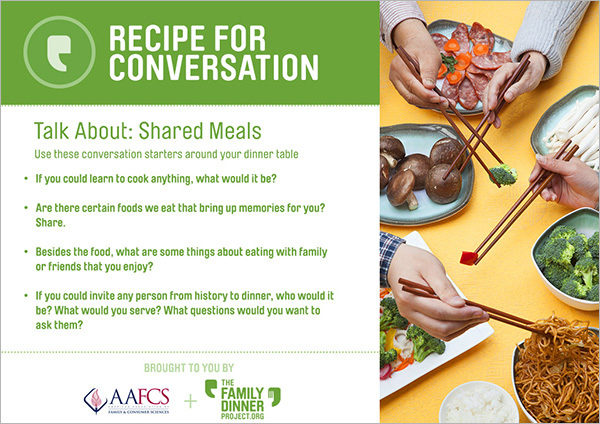 Use this Recipe for Conversation about shared meals to help your family focus on the meaning of the simple ritual of family dinner in the midst of the holiday hustle and bustle. Slow down and share some family fun. It’s all too common to let the holiday season rush past us, and to get caught up in doing things “just so.” Make sure to take some time to reconnect and share the joy with one another! You might try holding an Upside Down and Backwards night where you eat breakfast for dinner in your pjs or make a festive dessert before the main meal; have an Indoor Picnic in front of your favorite holiday movie (yes, you can have TV at the table just this once! ); or take a Walking Dessert with you as you view the neighborhood light displays. Share facts about global hunger and ideas to help. Not all families are fortunate enough to be able to share meals. The Family Dinner Project recently partnered with humanitarian aid organization CARE to help spread awareness about hunger worldwide. You can use our conversation starters to help family members of all ages understand a little bit about hunger and envision ways to help others. Share stories and build vocabularies at the table. Our friends at Usable Knowledge recently published this great interview with our co-founder, Dr. Anne Fishel, about how conversations at the dinner table help vocabulary and foster literacy skills in children. Are you sharing the gift of storytelling and imaginative fun with your family? Share the gift of family dinner wisdom for the holidays. Home for Dinner: Combining Food, Fun and Conversation for a Happier Family and Healthier Kids is not only a fantastic read, but also happens to be the brainchild of an FDP co-founder. It would make a great gift for those last hard-to-buy-for people on your shopping list! Share Your Stories with The Family Dinner Project. Warm up your winter with this Chai-Spiced Hot Cocoa – and make an extra batch of the mix to share with friends! It’s the thought that counts…right? Share the oddest gifts you’ve received in this fun table game! Share your hopes and dreams with one another using these conversation starters.